Fruits are flowers at the stage of seed dispersal. As such many have attractive displays for the purpose of attracting seed dispersers with the promise of a reward, either the edible fruit itself or a fleshy seed coat, or a fleshy tissue surrounding the seed, an aril. Here's the seed dispersal display of a sweet bay magnolia (Magnolia virginiana). Magnolias have many pistils in each flower and each makes a fruitlet, usually a tough little dry follicle that opens along one seam to release or reveal one or two aril-covered seed. The bright orange-red fleshy aril is both the visual attraction and the reward, the seed has a dark-brown tough seed coat. The seeds actually dangle on a thread to attract even more attention from birds who after digesting off the aril regurgitate the seed. Displays like this can last days, and disappear quickly when a flock of cedar waxwings stop by. Bit of a celebration because internet is back after changing service providers so this is the 1st blog posting using the new tubes. So far so good, things are working again. Last week's FFF post promised you another late summer flower to pair with the big white fragrant hosta. So here it is the big, blue lobelia (Lobelia siphilitica). This plant is pretty easy to grow and the population we have is from seedings. It also flowers over a period of a couple of weeks so it provides some long lasting color, and it's a big plant so it makes its presence known. It used to have Lobelia cardinalis growing along with it, but the big red lobelia does not grow well for us. The specific epithet siphilitica is another one of those old medicinal plant names, but it is also a rather toxic plant, so this is not a smart way to treat your VD. Our glasshouse has Euphorbia antisiphilitica, so maybe this lobelia gives you the disease? Hard to interpret. Now's the time to plant for some fall crops. Many of the same cool weather, early spring crops will grow quite well in the late summer and fall. Lettuces, spinach, and baby bok choi are our favorite so long as TPP remembers to buy the bok choi seeds in the spring for later; they usually have to be mail ordered as they are seldom for sale in garden shops. Some varieties can grow very fast and all of the Asian cabbage family vegetables can stay in the garden well into the fall. Chinese cabbages covered with leaves or straw can handle several degrees below freezing, and have stayed in out garden until the end of November regularly. The biggest problem is to keep the tree rats from digging up new planted seeds or young plants. Since our parsley has sort of pooped out, more of that can be planted too. Rather late for other fall crops, but green beans planted in mid-July are now beginning to produce. Row covers are a necessity to keep them from getting savaged by beetles. The middle of August is not the best time to visit our glasshouse because it's always hot and humid in there. But some plants like it that way. Our collection of cycads is decent and some are quite old, and since they grow so slowly some do not appear to have changed much over the past 4 decades. 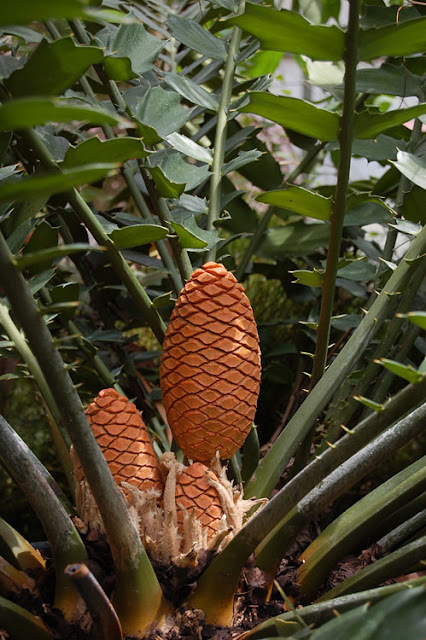 Here's a nasty one, Encephalartos ferox, the spines on the leaves are quite vicious; E. horridus is worse as if you could not guess. Every now and again it produces a few cones, and they are almost like flowers, a helix of fertile leaves, which in this case produce pollen. A colleague, to whom this image belongs, braved the tropical swelter to get a nice image for teaching. A few years back TPP braved bodily injury to remove and pickle one of these cones in ethanol. Isn't that a marvelous helical packing of fertile leaves? One of the problems with having a big garden is that it is a hand full for some one to babysit any time the Phactors are away, especially if things are a bit dry. Our trip to Savannah was just 10 and a half days long and yet it seemed we were absent for weeks. Several things are clear at this point, this year has been just about perfect for crab grass. It's luxuriant and it's everywhere. While commuting to work yesterday by bicycle, it was also clear that the giant ragweed crop will be monsterous. Beware if you suffer from its pollen. Several new additions to the garden were in serious need of water, but it looks as if all will recover. As the F1 pointed out, "you guys plant so many things in so many places no one but you know where they all are". She is quite right. And even if you had a map then either carrying water around or dragging hoses becomes quite a chore. She did get steamed crabs and Savannah beer. May have to see about getting a garden sitter in the future, especially if we are going to be away for a longer period of time. Even after just 10 days the kitty-girls act as though they were over-fed and starved for attention. The kitchen garden delivered some cucumbers, some tomatoes, a not too big zucchini, and sweet peppers. Eggplant may yet recover enough to provide more fruit. Soon the beans will be producing and time to plant fall lettuce and bok choi is approaching. To be completely fair, the same weather that is producing the crab grass and ragweed has also produced a huge display of naked ladies (and here too), and we has us hundreds.